Getting started with SEO for your website? 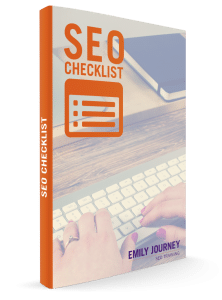 Download my free SEO checklist! Many people overlook search engine optimization when it comes to WordPress because they assume that having a beautiful theme is all that matters. However, there are actually many tasks that need to be performed to ensure that your site ranks well in the search engines. Here are 10 WordPress SEO tips that you can use to help you set up your new site. With a WordPress theme that features clean code, you are already off to a good start with your SEO strategy out of the box. A quality WordPress theme will offer a clean structure and uses valid HTML and proper use of meta tags. Having a site that loads quickly is also a plus in the eyes of Google because Google considers site speed as a ranking factor. Flash is a bad idea for SEO, period. If you want to add some “special effects” to your website, use WordPress plugins to do it or leave it out. As you start adding content to your new site, don’t forget to insert alt tags and title tags for each of your images. Image optimization is important for usability to permit blind and vision impaired users to easily understand the content on your website. However, these tags are also used by the search engine robots to get an idea of what the page content near the images is about. Most WordPress websites don’t come with a sitemap enabled out of the box. Therefore, you will likely need to install a plugin to set one up. Sitemaps are extremely important for helping the search engine robots to find and index your website. There are many SEO plugins that are available for WordPress. However, Yoast WordPress SEO is one of the most popular among WordPress users. If you want to make sure that each post that you create is optimized for the search engines, installing an SEO plugin can help you to select your target keywords and optimize the metadata for each post. Site security is increasingly important and Google has already confirmed that they will give higher rankings to sites that utilize the HTTPS protocol. Content is important for helping your site to rank in the search engines. However, only well-written content will help you to achieve these results. Avoid keyword stuffing and make sure that each page of your site offers valuable content. Keywords are important for helping your site to rank for specific search engine queries by users. However, keyword stuffing is still a huge mistake to avoid when it comes to SEO. Choosing the right hosting provider is extremely important to ensure that your site has as little downtime as possible. Internal links are extremely important for SEO and you must learn how to use links and anchor text properly. You should also make sure to link to many different pages of your website and not just the same posts or landing pages over and over again. These are just a few of the things that you will need to do in order to set your site up properly for SEO. If you want to achieve the highest possible rankings, you will need to learn how technical SEO works or hire a qualified SEO expert to assist you.